Preheat oven to 300 degrees. Butter and flour a 9x5-inch loaf pan; aside. In the bowl of a stand mixer cream the butter, sugar, and orange zest until light and fluffy, about 2-3 minutes. Add vanilla extract, then add the egg yolks one at a time, mixing after each addition. In a medium mixing bowl whisk together the flour, salt and baking soda, then with mixing speed on low alternate adding the dry ingredients and yogurt. In a medium mixing bowl whip the egg whites until stiff peaks form. Gently fold in the cranberries, then the egg whites using a large spatula. Pour into the prepared pan and place in the oven to bake for 45 minutes to 1 hour, or until a cake tester inserted into the center comes out clean. Remove from the oven and allow to cool for 15 minutes before removing the loaf from the pan. To prepare the glaze, in small mixing bowl, whisk together the powdered sugar, orange juice/zest, and vanilla.Spread over the loaf and allow to drip over the edges and sides. Allow to sit for 20 minutes to harden before serving. 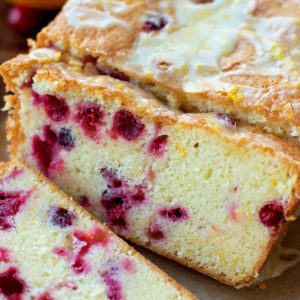 -You can easily swap out the orange zest for lemon zest, and the cranberries for blueberries.